This was our conversation in April 2002 as we pushed our then five month old son in his buggy as we approached the route of the London Marathon on the Isle of Dogs ready to cheer the lead runners. I cannot really blame her for laughing and not taking me seriously, it’s not as though I was taking part in any form of exercise at the time let alone running. Forward onto 2009 and I start to make good on my earlier promise; exercise has begun through karate training and I start to head out for a weekly jog. I enter my first race at the end of the year and step up my jogging in preparation. Around this time I start to refer to myself as a runner rather than a jogger and I run my first half marathon in 2010. I then enter the London Marathon ballot for the first time and receive my first rejection letter, which is a pattern that will follow for a further five years last until the end of time. Fortunately I make good use of the time to up my training and lower my 10k personal best through a number of races. I finally get tired of the London Marathon sending me rejection letters (just how degrading is it to be told “It’s not you, it’s me” by a race every year?) and I enter the 2012 Brighton Marathon early in the registration period so that I can guarantee a place. This led me to complete my first marathon in a somewhat disappointing 4 hours & 47 minutes. I have since gone on to join my local running club, which has been great for my Sunday long runs, and I continue to enter races throughout the year. I still dutifully enter the London Marathon ballot and the club ballot … maybe 2013 2014 2015 2016 2017 2018 2019 2020 will be my lucky year? 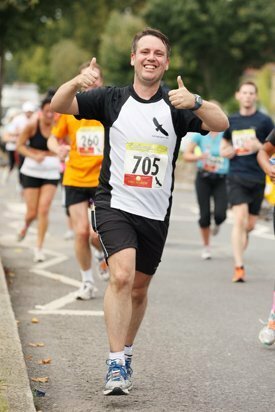 However, I took on a spring marathon in 2013 as I completed the Richmond Park Marathon in 4 hours & 24 minutes and then the Abingdon Marathon in 4 hours & 35 minutes during the autumn. My running went well through the end of 2013 and I upped my game by nailing my marathon training plan to record my second sub 1 hour & 40 minutes half at Reading as part of my schedule before toeing the Brighton Marathon start line in peak condition to finish in 3 hours & 50 minutes. I was properly battered at the end but knew I had given everything I had on the day and was delighted with my first sub 4 hour marathon. I ran the Richmond Park Marathon again with The Son cycling parts of the course with me. There was relentless sunshine, it was hot, and I pootled around hugging any shade I could find but I had a blast spending time with The Son. My running took a nosedive in 2017 thanks to rolled ankle on a pathway in disrepair, which broke a metatarsal bone and caused damage to my foot and ankle. Thankfully I am back to full health and now back running with Maple, my four legged furry running buddy. This blog documents all the trials and tribulations of my marathon training alongside some of my thoughts on previous races and the general goings on in all things running.